When an opponent’s monster declares an attack: Target the attacking monster; destroy that target. Sakuretsu Armor is our Throwback Thursday Card of The Day. This card used to be a pretty damn good card. Opponent attacked, destroy the target. Simple, easy to use, anyone could run it, and they did, but that was when the card pool wasn’t what it is now. Nowadays, this card isn’t good enough to hang. You can’t chain it to destruction, it only takes out one monster, only can activate it in the Battle Phase. Too many cards can be chained outside the Battle Phase, don’t need their opponent attacking, and even the ones that need an attack can do more than destroy just one monster (any Mirror Force). Once one of the best traps in the game is now not even worth considering to be run in any deck, Sakurestu Armor. Sakurestu Armor is a simple Trap that destroys a monster your opponent controls that is currently battling. Very easy to see why this was more popular back in simpler days with a smaller card pool, now we got tons of battle traps and they mostly don’t see play now-a-days. If you want to play battle traps, just stick to one of the many Mirror Forces we have now, it will be much more effective than this. 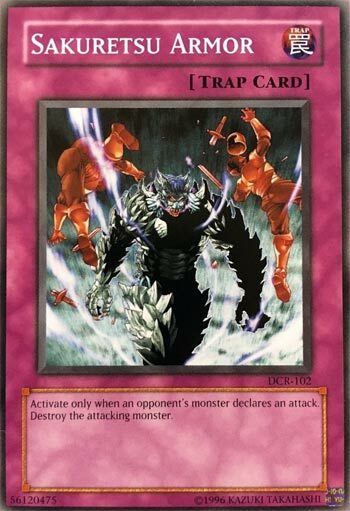 Only good when there is really only one specific monster you want destroyed while the other cards you don’t want to destroy or anything, but again there is a Mirror Force to help with a case like that, even though the monster you would want destroyed will go back to the hand or deck or go face-down. Still, play any Mirror Force over this, it isn’t the early 2000s anymore. This is a wonderful choice for Throwback Thursday. I know I’ve reviewed this a handful of times over the years. For one, this card went a long time without saying in its text that it targeted. Just felt like pointing that out. Sakuretsu Armor is old, I can remember the first time I reviewed it (after checking the CotD archive) was just a handful of months after I started in 05. Back then, people were starting to use this for the first time. In multiples too, and of course, things were different 13 years ago. We had less options at our disposal, and as our good friend Ex Minion of Darkness use to say, sometimes it isn’t so much a card turns bad, it’s just the environment makes it bad. To that point, circling back, this card still does what it does well. Just, other cards do more for the same price (Mirror Force) and that can make cards that use to be good, irrelevant. I still like Sakuretsu Armor, however. Yugioh needs more cards like this. A generic and honest 1-for-1, with no cost, that you can still generate advantage of off. But alas, this game is a game of advantage after all, and this card doesn’t provide enough anymore.